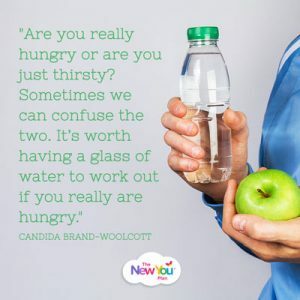 Our Customer Transformation Coach Candida shares 5 reasons to drink more water, and why this is a vital tool in your weight loss journey. Water may well indeed be the most underrated tool when it comes to losing weight. I thought this would be a fantastic opportunity to explain to you why we encourage you to sip sip sip your 4 litres of water every day! There are so many incredible benefits of drinking water. Our body is comprised of 80% water. 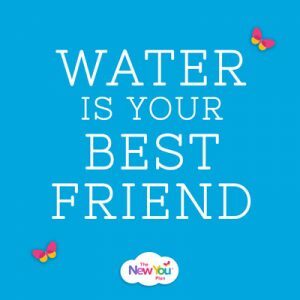 Water makes up nearly 85% of your brain, about 80% of your blood and about 70% of your lean muscle. This is why we need to be continually replenishing our body with fresh water. It is very difficult for our body to get water from anywhere else except fresh water. Soft drinks and alcohol rob our bodies of water and beverages such as coffee and tea are diuretics. Here are five amazing reasons to drink more water to help you burn more calories, reduce overeating, and shed those pesky pounds. Water boosts your metabolism. Every time you eat or drink, your body has to work hard, burning calories to process whatever is coming in. The carbohydrates and proteins that our bodies use as food are metabolised and transported by water in the bloodstream. Are you really hungry or are you just thirsty? Sometimes we can confuse the two. It’s worth having a glass of water to work out if you really are hungry. Water gets rid of those nasty toxins in your body, in particular from the digestive tract. Flushing out the toxins will improve the clarity of our skin and actually reduce fat deposits in your body. Water boosts energy levels. Dehydration has a very clever way of disguising itself as tiredness. By keeping your water levels up, that 3pm slump will vanish and you will crush your fitness goals. Water regulates our cooling system especially when partaking in moderate exercise. Studies have shown that sugar boosted sports drinks are not as effective as wonderful water. Four litres may sound like a lot of water and a little daunting to consume in one day but soon it will become second nature to you. ✔ Use the Water Flavourings for variation. You can add these to water, either hot or cold to mix things up. ✔ Use your Water Flavourings to make ice lollies, which are the perfect guilt-free treat on a hot summer’s day. ✔ Switch things up by having soda or sparkling water too. ✔ Keep a bottle of water in your bag and a couple in your desk drawer so that you always have a bottle to hand. ✔ Each time you go to the kitchen, have a couple of sips. 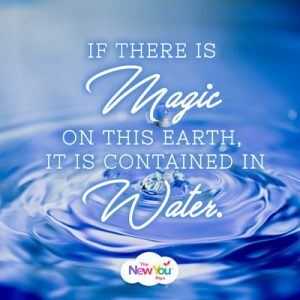 So now you know how magical water is and why we encourage you to sip your water throughout the day. 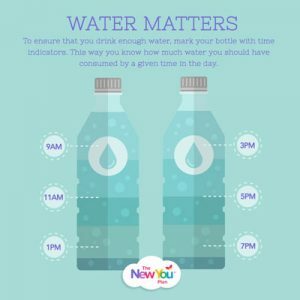 If you would like a speedier weight loss, more energy and beautiful clear skin, increasing your water intake each day will definitely help! Drinking large amounts of water in one go is not advisable but sipping it throughout the day is absolutely perfect. 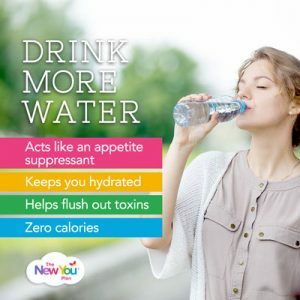 Water is without a doubt the driving force to optimal weight loss! So go on! Sip, sip, sip your way to a slimmer New You!